These chocolate banana muffin treats are yummy!! They seem to me to be some mix of chocolate cake and brownie in texture and flavor, with a touch of banana flavor blended in. The texture is light, moist, tender, and rich, with a crispy sugared topping and lovely gooey bites of chocolate chips blended in. I used my square pampered chef pan, which I've totally fallen in love with. I love how easily muffins (and other treats) slide in and out of that pan! If you like the flavors of chocolate and banana together, these muffins are definitely worth a try. Although I have a hard time justifying these as anything other than dessert - but nonetheless they are muffins and have bananas in them, so that totally counts as breakfast-worthy I believe! In a medium size mixing bowl, combine the flour, 1 cup sugar, cocoa powder, baking soda, baking powder and salt. Whisk to combine. Set aside. In the bowl of a stand mixer blend the bananas until well mashed. Add in the vegetable oil, sour cream, vanilla extract, and egg. Blend until well combined. Gently stir in the dry ingredients just until combined. Stir in the mini chocolate chips by hand. Prepare your muffin tin by spraying with non-stick cooking spray. 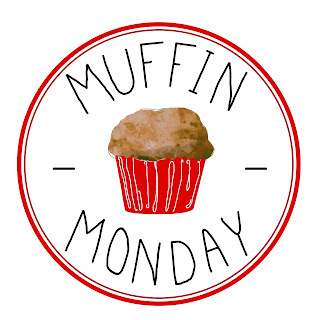 Distribute the batter into 13 - 14 total standard sized muffin wells (use a regular pan with 12 wells, and distribute the remaining batter into a mini loaf pan, mini muffin tin, use a couple stand alone silicone muffin molds, second standard sized muffin tin, or discard as preferred). The wells should be approximately 3/4 full. Sprinkle the regular sized muffins with 3/4 - 1 tsp sugar each for the crackled topping. Bake for 22-25 minutes for regular sized muffins, and 10 minutes if using a mini muffin tin. Great flavors this month, Rebekah! And I am coveting your square muffin pan! Doesn't get better than chocolate and banana, Rebekah. Oooh, a square muffin pan? A kitchen toy I do not own? =) Your muffins sound really delicious and I could easily justify them for breakfast. Banana + chocolate is a great combination. Thanks, Rebekah! I've never seen a square muffin tin before! That's so fun!! Love that crinkle top, too.